An Evanston firefighter examines the damage of a fire Wednesday evening. The blaze broke out in the 1900 block of Hartrey Avenue. A former city employee died Wednesday after a house fire in west Evanston, city manager Wally Bobkiewicz said. 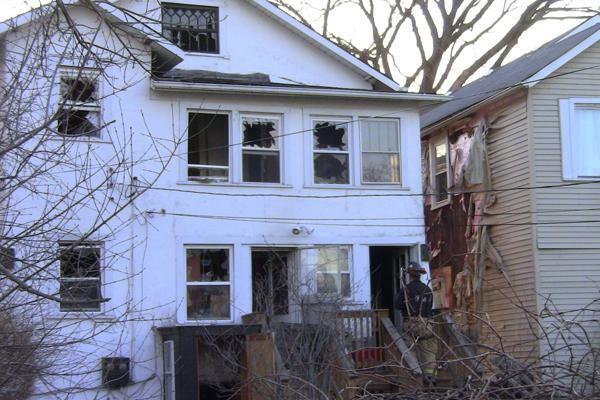 The blaze broke out shortly after 5 p.m. in the 1900 block of Hartrey Avenue, and the Evanston fire department had the scene under control within an hour. But Fred Davis sustained second- and third-degree burns and was rushed to Evanston Hospital, where he was pronounced dead. A police officer who discovered the fire while patrolling the area was treated for smoke inhalation, Evanston Police Cmdr. Jay Parrott said. The officer was said to be in good condition Wednesday night. The fire broke out on the first floor, and Davis was alone in the building, said Dwight Hohl, the Evanston fire division chief. The windows of the two-story home were shattered, and the fire scoured the east-facing wall of the adjacent residency. Residents gathered in front of the Friendship Baptist Church across the street. City employee Kelly Young knew Davis as a retired city worker who volunteered at local food pantries. “He was a pretty good guy,” Young said. Longtime Evanston resident Larry Garrison, who lives down the street, said he noticed smoke and fire at the residence as he was coming back home in his car. “I didn’t see nothing, in ten minutes, I saw the police coming and I saw the house blazing,” Garrison said. The Evanston fire department responded to the blaze with assistance from fire departments in Skokie, Wilmette, Morton Grove and Winnetka, as well as an investigative team, Hohl said.